Substitute Swiss cheese for American if you prefer. Both are good. My patty melt recipe is diner style. Use one or more of the calorie lowering tips below for a healthier version of the sandwich. A patty melt will change depending on what part of the country it is being served in. Big and thick on hard rye rolls to a slim version buried in sweet caramalized onions on dark rye bread. I've eaten patty melt sandwiches that use a variety of cheeses and condiments. My favorite patty melt recipe is the all American classic diner version. But you can cut calories dramatically by using a leaner ground beef. Cut 124 calories when you exchange four ounces of 75/25 ground beef with 95/5 ground beef. Use a quality natural cheese and reduce calories even more by using miracle whip instead of mayonnaise. Here's my diner Patty Melt recipe. Nothing fancy. NOTES: Exchange most of the cooked caramalized onion for tomato slice and lettuce and your patty melt sandwich transforms itself to one of the more interesting low calorie sandwiches you can make. CALORIES: 475 for a quarter pound patty melt. Reduce 100-124 calories with 90/10 or 95/5 ground beef. Mix first four ingredients and shape into oblong, thin patties. Patties will shrink and get thicker when cooking. Keep cold while preparing onions. In large, heavy skillet over medium-high heat, cook onions in oil until soft and beginning to brown. Stir frequently, season with 1/8 t. salt and dash of pepper. Keep warm. Cook beef patties in skillet over medium-high heat 2-4 minutes until nicely browned, turn and top with cheese. Continue cooking until meat is done and cheese is beginning to melt. While patties are cooking, spread thin layer of butter on ONE side of each piece of rye bread and grill in separate pan or on a grill. To assemble -- place patty with melted cheese on UN-grilled side of bread, top with onions. 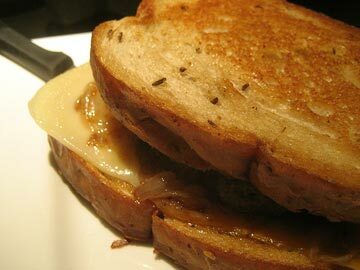 Spread Miracle Whip lightly on UN-grilled side of top piece of bread and place on top of onions.